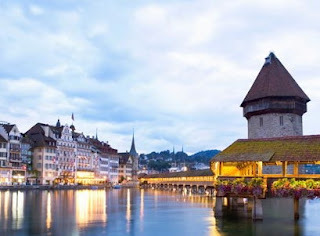 Lucerne a trading city as well as a tourist destination. Lucerne is abundantly all kinds of natural beauty. With the background of the eternal snow throughout the year, and this means that during the four seasons always seemed decorate the top of the Alps Mountains. While the stretch of pine forest surrounding the city, combined with very clear water lakes shimmering blue. Although the located is deep in the central Switzerland and mainland Europe, Lucerne every time attract hundreds of thousands of travelers coming from all over the world. All beauty is equipped with a water excursion on Lake Lucerne, the lake area of ​​38 square kilometers that integrates with the Lake Uri, until to the steep wall of rock hills in the Alpine region. One of the main attractions of Lucerne is a wooden bridge, which stretches on River Reuss. Bridge on middle of the city known as The Chapel, built in 1333 and believed to be the oldest wooden bridge in the world. For more than seven centuries, the bridge has been several times (last in 1993) was engulfed by flames. Every time the fire occurred, the local government then intervened restored. This bridge can always seemed intact, and somehow less ever deterred and felt able to survive, even though all the beams submerged in water for hundreds of years. Although the course of history has made the most of buildings on Lucerne began look old due to age, the traveler can actually enjoy the charm of classic beauty and tranquility of life of rural communities in a European city. On the other hand, Lucerne is also trying to take beautify themselves without leaving the old one. The city was able to display the characteristics of modern society, complete with all sorts of facilities. Lucerne as examples of Catholic city that was built by the Federation of Switzerland, in order to meet the recommendations of the Convention on Trent 1545-1563. Not just Catholics, even in the beginning the management of the city is specifically handed over to Jesuit Order. Thus, on Lucerne a number of prominent church attendance. Every Sunday, the trade center turned quiet because of closed. Lucerne community, since the XVI century build an educational center specifically Order of the Jesuits, and equip it with a variety of additional buildings. They founded a church dedicated to St. Francis Xavier (1506-1552). The church construction began in 1666 and completed eleven years later. The church is very interesting because of marks the trace of the Baroque style, which had the greatest impression on the world of architecture. On the inside of the church, saved many ancient paintings and sculptures indeed very beautiful.